I've had this tee shirt for a while now - in fact I bought it as soon as it was released by the lovely Betty over at http://talesfrombettybeetowers.blogspot.co.uk/. Stupidly on my part though, I stuck it with my working jeans, and it quickly became a 'I'm working on my house' tee shirt. I'm wearing it in the office! 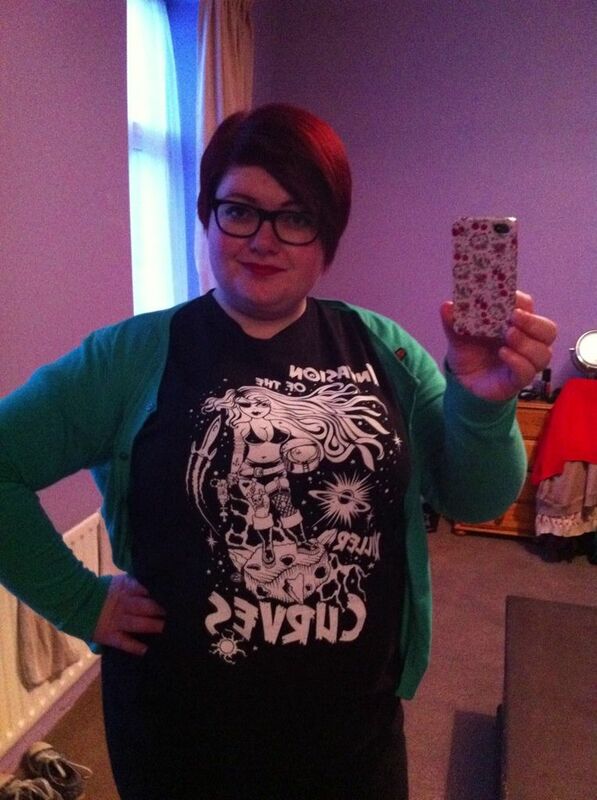 It's a 'dress down' day in honour of one of my colleagues, and so, I thought I would rock out my Killer Curves tee. The tee shirts are available here, with slash necks as well. I've never got on with slash necks in the past, so went with this standard shape. Invasion of the Killer Curves indeed! I had had thoughts of wearing this tee in the office, but always discounted it on ground of, well, how would I wear it. Being in 'mid move' mode, more than half of my clothes are still at my parents. On Wednesday I threw some more into a box and hurried home. When two items fell together. My black skinny jeans, and this tee. At which point, an idea was born. In my head, I would look like Sandy at the end of Grease, in her tight pants and skimpy top. Instead of a leather jacket I decided to pair it with my green Little Miss Delicious cardigan (available here). Not seen are my leopard print flats to add a hint of glamour to the outfit. Once my red lippy was on, I knew this outfit was a winner for today! I love when an outfit just pieces together by accident ! Love love love the cardigan!! Such a cute outfit! 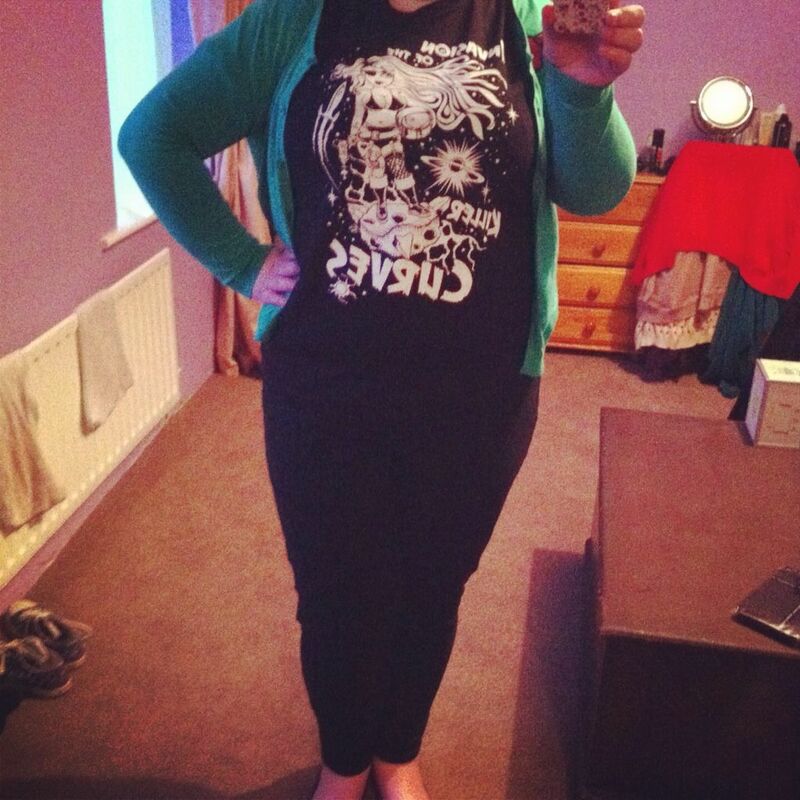 Lovely casual outfit :) Great t-shirt! Ahhh.... Sandy at the end of Grease! That is one of my all time favorite looks (that I've been wanting to emulate since I was 8.... Down to stealing my moms pumps and hoop earrings). I think your outfit is quite awesome! Love the t-shirt!